A Follow-Up: The Winning Numbers were…! As we knew already, the duality was unbelievable in the numbers this season. (My numerology teacher would never have tried to call it.) So I went back to see what may have been the reason numerologically for Nyle and Peta’s win. As we have seen before, so many of the couples this season had amazing numbers, with tons of NATURAL MATCH numbers, more than I’ve seen in any season ever since I’ve been doing these numerology posts. The cause for so many NATURAL MATCH numbers has to do with the fact that the year 2016 equals a 9, which makes it so that everyone’s Personal Year number matches their Life Path number. (Too complicated to cover here.) Read more..
It’s a Tight One, Folks! Undoubtedly you know who Pythagoras was. Well, if you don’t, surely you remember his theorem that you labored over in geometry class, a2 + b2 = c2. Remember him now? 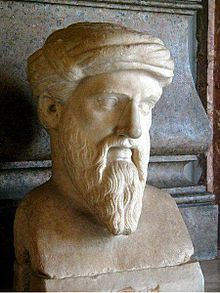 Well, this guy Pythagoras was a well-renown Greek philosopher who taught all of his students how to “read” numbers. In fact, he’s considered the first “pure” mathematician (math that has no practical purpose), and also he was the originator of what we know as numerology today. But, Pythagoras had other credits too. He was a philosopher, scientist, astronomer, musician, and a spiritual teacher. He taught his followers that a person’s entire destiny could be read from the numbers of a person’s birthdate and name. His foundational premise was that everything in the universe vibrates to its own frequency and is represented by a number. Pythagoras and his followers were not the only group that believed in the impact of numbers on one’s life. Enter the Chinese, the Japanese, as well as the Chaldeans, Hebrews, Egyptians, Phoenicians, even the early Christians. And of course, we all know about the Mayans (and their famous calendar), and the Incas. Let’s get started, shall we? Read more..
DWTS Season 21 Numerology And Astrology Predictions: How did Dona And Vogue Score? So, how did Dona and I score with our Numerology and Astrology Predictions for Dancing With The Stars Season 21? First, Dona weighs in and then I’ll chime in later…. Do Numbers and Stars Rock, or What? Hi everyone! Wasn’t that an incredible Season 21 finale!?! For those of you who read my numerology post and Vogue’s astrology post this season, it was pretty obvious that this was Bindi’s season. The numbers and stars spoke pretty loudly about that, didn’t they? It was just a matter of who would be in 4th, 3rd and 2nd place. Before closing out for the season, let’s add some final information to the whole subject of the numbers. Below is another interesting tidbit of information that we thought you’d find interesting. Derek’s multiple wins on Dancing With the Stars give us plenty of opportunity to look at what “winning” numbers look like. Here’s some additional data about his wins that is almost freaky. It turns out that the date of the “Results Show” has been either a 1, 5, or a 7 day for each of his six wins. Those three numbers are all NATURAL MATCHES to each other and Compatible to Derek’s Life Path or his Attitude number. Hi All! Dona and I are back with our new Numerology and Astrology post for Dancing With The Stars Season 21. Long time followers, you might have noticed we didn’t do our Predictions last season. There was just too much manipulation going on that nothing added up like it did in the past as you will soon read by Dona. However, this season is different. For the most part, every week has stayed consistent. It’s funny as Dona was sending me her early Numerology predictions and she was nailing them every week. So, are you ready for our new report? If so, read on and be sure you let us know what you think in comments as this has been a huge work in process all season not to mention a physical and emotional one at the end for us both. We hope you enjoy…. May The Numbers Be Ever in Their Favor! Another season of Dancing With the Stars! And it’s that time again to play around and have some fun predicting who will win. We have some worthy contenders, for sure. So who’s likely to hoist that coveted, sparkly Mirrorball on the 24th? Well, that’s what we’re gonna try to determine through the use of the science and art of numerology. Are you game? Normally, in numerology, when it’s just too close to call, which is called having “too much duality,” you don’t even want to try to predict anything. But, hey, this is the Dancing With the Stars Finale we’re talking about, and we’re all vested in one couple or another, right? So, even though there is quite a bit of duality, and the numbers are not as clear-cut as in prior seasons, let’s take a stab at it, shall we? If you’re willing, we’ll get started. Oh, but wait! If you didn’t get a chance to read last’s week post, you may want to start there, as there is quite a bit of introductory information that I will not be repeating here. Some of you have said that this numerology is fascinating, but all so confusing. Let me help you. I don’t expect that you are going to internalize all the information presented below in just one reading. Really, I don’t! ☺ But here’s a tip for understanding as we go. Just look at who has the most yellow in the charts, and/or secondly, the most blue? Simple. Does that help? Hope so! Below is what those Read more..
Hi All! It’s Vogue back again to introduce another one of DonaMadrina’s fun Numerology Prediction posts. This time she analyzes the couples numbers for the Finals of Dancing With The Stars Season 18!! Dona also goes through last week’s numbers for what happened in the Semi-Finals. I’ve also included a little Astrology information in this post at the end for you to think about in mixing up things further. 🙂 Ok, let’s get started, shall we? So Charlie went home! 🙁 Was that surprising to me from the numbers? Yes…and no. As I mentioned last week, numerology is as much an art as a science. Knowing how to “read” the numbers takes years of practice, especially when there is so much duality in the charts, i.e. too close to call. Hindsight is golden, as they say. And, darn! I wished I had talked about “Week 9’s” numbers in the verbiage of Part I. Though I included the charts, had I elaborated on them, we’d have seen an important piece of information that might have hinted at Charlie possibly being in trouble. Charlie’s elimination is much more obvious now – but this is hindsight. Read more..
Hi All! Vogue here and are you ready for tonight’s Dancing With The Stars Season 18 Semi-Finals? We have a special treat for you today to take in before show time. DonaMadrina is back with her seasonal Numerology Predictions and Analysis. She’s put forth a lot of effort into this project as once she began, one thing kept leading to another as you will soon read. Special notes before you begin: note how there is a “Battle of the 9’s” this season. Also, there are some “challenges“, but, is that necessarily a bad thing for the way some like a challenge and/or have turned them inside out? Lastly, Candace Cameron Bure has a Life Path Number of 7 which matches the World Number of 7 for the entire year of 2014. Could this have possibly been a factor for how she survived elimination so incredibly? I don’t know, but, this is a fascinating read to think about. Read on, study everything, and then let us know in comments who you think might be going home tonight and who you do you think will take it all? A special thanks to Dona for all of her time spent on this “labor of love” and we can’t wait for Part 2 next week!!! Ok, here is Dona…. Man, oh man! I thought last season was tough for calling as to who would be in the finals. Nope. This season is even tougher. Many are thinking James is the next to go, and on paper, he could be — however….let’s look at the numbers step-by-step. Numerology is not an exact science. There are many factors that must be considered and weighed, and that’s where numerology becomes an art. Certain numbers, for example, are natural matches to each other, and in the chart below they are represented by EXTRA SUNNY days. Some numbers are compatible to each other, and in the chart are listed as Good days. Then there are the Challenging numbers, numbers that are toxic to each other. When looking at our Dancing With The Stars couples, we have to remember that their lives are more than just Dancing With The Stars. What may appear to be a “challenging day” may have nothing to do with their public lives, but just possibly their private lives behind-the-scenes. And then, of course, we have a person like Derek Hough, who welcomes challenges. When a “challenging day” appears for him, does that mean it’s going to be a bad day…or just another opportunity that he welcomes? In Week 6, both Candace and Mark had challenging days, were placed in jeopardy, but ended up being called SAFE. So, as you can see, there are many factors that enter in, but to keep it simple, we’ll just talk basics for this first post. Read more..
New Astrology And Numerology Study And Predictions For Dancing With The Stars Season 17 Finals!! What interesting Astrology personalities and unions we have this season for the Dancing With The Stars Season 17 Finals!! Making this season unique from others, would you believe it if we told you we have two Taureans and two Capricorns in the finals? And to make things even more interesting a Scorpio, an Aquarian, a Pisces, and a Leo are thrown into the mix. Read further to see how the couples Astrological sings might and might not stack up and if you think this might help or hinder them for the finals? DonaMadrina has also included a new Numerology Forecast for us to consider being she was interesting in diving into their “Monthly” and “Yearly” numbers a bit more being their weekly numbers are so close and tight. Note how (once again), she nailed it with her Numerology forecast last week. Tony Dovolani was the only person to have a “red challenging” mark and…well, we all know how that turned out. Also included below is a Horoscope Forecast for each sign from Astrologer Patrick Arundell who is quite a fascinating and fun fellow. If interested, be sure to subscribe to his You Tube site for he forecasts each sign every week. One more thing before you read further, be sure to see Pure Derek Hough for more with Amber and Derek as DonaMadrina has personally studied and forecasted what is in Derek’s Astrological forecast and it is fascinating to say the least. Union Together: These two may be opposites being Capricorn is normally reserved and ‘all business’ versus Aquarius’ sense of adventure and playful side. However note how Corbin was born on the cusp of Pisces as well which means he may have an intuitive and imaginative side. The fish can swim high or low….and their moods can do the same. In turn and with all the above combinations, they may have a way of soaking each other up like a sponge when it comes to educating and learning from one another and I definitely think this is what we’ve been seeing in them both along their journey. Do you agree? Union Together: These two signs together may have some conflicts …especially in the beginning. Taurus likes to control while Aquarian wants to be independent and find their own way. However, one thing they do share is a common passion for all things in life….and a grace, warmth, and caring for others (animals and people alike) as well as being lively and adventuresome. They also share a rebellious trait when challenged and times get tough as they both just want to fight that much harder. If these two can find a mutual balance and respect what makes the other tick in the conflicting times, tremendous things are possible. In other words, when they have found that happy spot, watch out. They are unstoppable, enthusiastic, and creative. Is this what we’re seeing in these two? I think so. More with these two at Pure Derek Hough. Union Together: Think ‘the best of friendship’ with these two. Though these two can also be Read more..
Donamadrina: Numerology is not an exact science. Just as in Astrology, where you have to consider more than just one’s Sun Sign, so it is in Numerology where you have to consider more than just one’s Life Path number. Also, when looking at our Dancing With The Stars couples, we have to remember that their lives are more than just Dancing With The Stars, and the scoring results. For example, in Week 8 (November 4), both Amber and Derek had challenging numbers, so I was thinking, sadly, it just might be their last week. However they were declared SAFE. So what did their numbers refer to? From what we knew of their private lives, both were challenged health-wise, Amber with her recurring knee injury and Derek with his recurring back injury. In another example, on November 11th, each couple had a partner with “Extra Sunny” numbers. So who had to go? From the challenging numbers, either Corbin or Amber should have been eliminated, right? However, they were both declared SAFE. We know Amber was still “challenged” by her knee injury, not sure what Corbin’s challenge was. Each had the voting numbers to stay around though. Elizabeth earned a 30 for her last dance (Extra Sunny), but… Read more..